Participant / leader, skilled in communicating concepts and gaining support for new ideas. Enhance expertise to deal with global clients and business partners. Understand cultural diversity and harness it to positive energy within teams. An ardent believer in the power to communicate ideas and advance human endeavours. Have successfully implemented LEAN methodology and Agile framework in most of my teams. Developed, presented and implemented processes for incident management and Quality Control. An impressive growth percentage has been recorded year over year. i managed the Business Intelligence Support Team for Deepak. The main objective provided to me and that which I accomplished was to transition from an adhoc support team to an industrialized support team. standardization of all aspects was the key to continued success for the business. Have a very high level of expertise on MS Office. 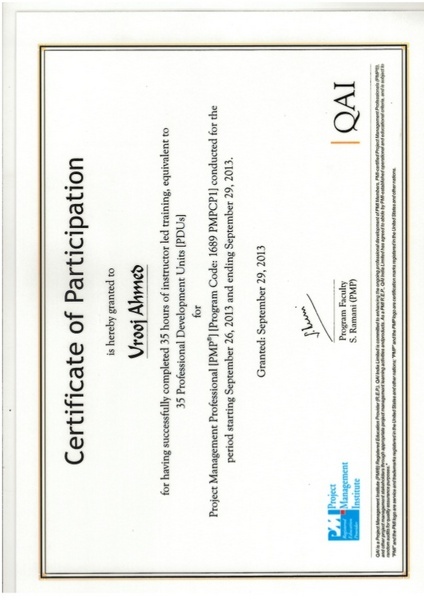 Have conducted many advanced trainings on using Excel for statistical analysis and building complex VBA coding. I have also received appreciation and awards for building indept data analysis presentations. Worked extensively with Microsoft Visio & Microsoft Project Plan. Have good hold on CSF and a decent knowledge of HP Dialogue. These enterprise content management tools are the base for creation of print media for the company. Have worked extensively on many web based application development projects. JDA is a leading name in Supply Chain Management software products. The company offers products and also has a cloud offering for its clients and my team is responsible for level 2 support for these clients. The sheer number events taking place in back-end for all the cloud clients is enormous. The issues that can happen in the entire scenario are so broad over a spectrum that it becomes a full time job to drowse the fire. Responsibilities encompass a regular evaluation on issues and analysis on the same.In-dept analysis gives patterns and some level of predictions which are used for preventive corrections. Manage a team working 24/7 across the globe to ensure that no issue breaches the SLA, impacting the client. Working with product development team and Database teams for permanent solutions which also welcoming new clients over the cloud while working with transitioning teams. Managed a BI team with French language expertise that serves AXA as the client. The objective any support team is to be on time and on Quality. This team provides service to ensure all L2 and L3 related tasks of the BI team are managed offshore. The key focus was on planning, initiating, implementing, measuring and reporting. This ongoing process ensures we provide QOS and we are able to determine loop holes and improvise continuously. Mode implemented for continuous up-scaling of QOS, is track, measure, analyse, devise, implement, stabilize and cycle again. A MSBI team working for three AXA entities and transforming raw data into meaningful and useful information for business analysis on a daily basis. SSIS, SSAS & SSRS development and BAU for the data mart are managed by the team. We process data from various locations, various formats and feed information into a centralized repository. Being on time with quality information is key to BI activities and we ensure the business does have the needed reports on or before time. Worked along with different business units to ensure we understand business needs well and propose future BI projects. Utilizing the team on R&D projects to enhance our business value and build stronger capability within the team. Managed Document Management Solutions program for ATSS, the program is designed to build and manage the development of financial documents of AXA across the European continent. The program has been a great challenge and a success to all the efforts. Collaborating with management of AXA entities across the European countries to increase our service base, defining & implementing processes to ensure high quality service and build customer satisfaction. Work for implementing process changes and enhancements at both ATSS Banaglore team and at Paris. Have successfully managed and delivered, from initiation to closure at least 7+ projects in year 2014 generating a SOW of 605K Euros. Led a cross-functional international team in developing infrastructure to build an effective and performing SDLC for the program. Defined and successfully implemented processes for transition of critical projects. Designed “best practice” testing methodologies that were adopted as standards for many off-shoring project transitions. Delivering on a regular basis, an approx. of 5% cost savings by continuous innovation and implementation. Design interface and web applications for a various business modules. One of the key projects was Server Utilization & Billing at Koln, Germany. The project was designed to accept VSAM data regarding the CPU load on 300+ servers. Many AXA entities utilized these servers across the European region; based on the applications installed on a particular server along with the server utilization load the monthly billings were generated. A challenging program involving a great deal of data that needed to be analytically and statistically processed. Automated processing and billing did reduce the turnaround time from weeks to hours and also eliminated the room for error in the billing process. Enormous saving generated as the entire process was automated with minimal human intervention. Successfully delivered many applications for the business; Worked for clients in Tunbridge Wells – UK, Leicester-UK, Ipswich-UK and Bangalore. I was awarded for providing new solutions to maintain a critical legacy application on Visual FoxPro, Tunbridge Wells- UK. The application design was to provide an interface to revise the various insurance offers based on inflation, market correction and business competition. Worked as a trainer for the client team in Leicester – UK, and was appreciated for the same. Worked as a freelance software developer; the area of work was primarily on building accounting and inventory management software’s. My clients during this phase were small scale businesses like pharmaceutical warehouses, petrol banks and textile wholesalers.